Android Nougat MIUI 9 for Redmi Note 4 Mediatek is available to download. The MIUI 9 for Redmi Note 4 MTK (nikel) is the brand new BETA ROM released by Xiaomi. This is an update guide of Nougat based MIUI 9 BETA ROM for Redmi Note 4 Mediatek. This is a manual flashing guide. If you have already rooted or installed some other ROM on your Xiaomi Redmi Note 4 Mediatek then this guide will be handy for you. If you are already on stock ROM then just wait patiently, because most likely you are going to get official OTA update of MIUI 9 on your device. Download the MIUI 9 Fastboot zip file to a PC installed with MiFlash tool. Follow the MIUI 9 Fastboot ROM flashing guide using MiFlash utility and update the Redmi Note 4 Mediatek to MIUI 9. Download and copy the MIUI 9 zip file to the phone’s internal storage and copy it inside a folder name: “downloaded_rom”. If the directory is not present then create it. Follow the MIUI 9 ROM flashing guide using recovery method. That’s all !! If you have done things correctly then your Redmi Note 4 Mediatek would now have updated to Android Nougat based MIUI 9 BETA ROM !! If you face any problem while installing then just login and place your concerns here, I will try to help you out. 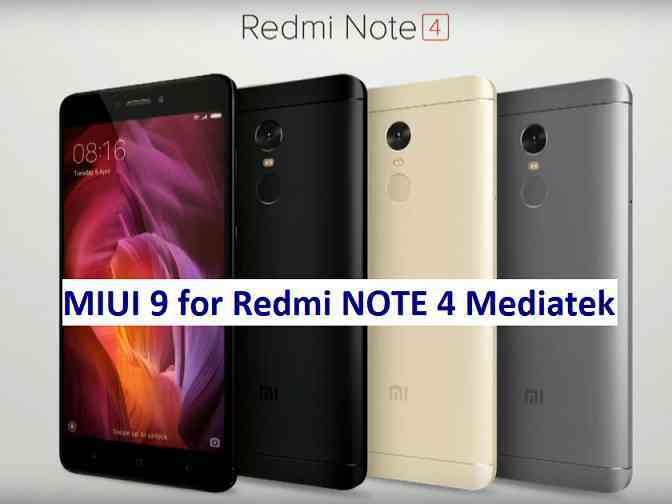 For more Custom ROMs like: LineageOS, Resurrection Remix ROM or any other ROM, TWRP Recovery Installation guide, Rooting Guide you can have a look at the Redmi Note 4 Mediatek forum and also you can subscribe to stay updated for this device specific topics.